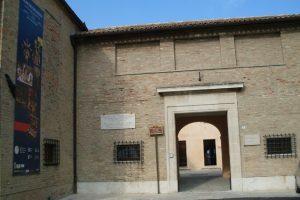 The Diocesan Museum is located right next to the Cathedral, inside the premises that once housed the Bishop’s Palace, for centuries the home of the bishops of the city. Walking through the 18 rooms of this museum, arranged in chronological and thematic order, retrace the twenty centuries of Christian history of Ancona. In addition to an art gallery with works from the fourteenth to the nineteenth century, it preserves sculptures, scrolls, sarcophagi and collection of coins and medals of the Roman and Medieval periods. You will be fascinated in front of works of exceptional value: like the four Flemish tapestries woven on cartoons drawn by P.P. Rubens representing the most important moments of the Christian liturgy and the Sarcophagus of Flavio Gorgonio, decorated with reliefs depicting the Traditio Legis (IV century). A guide will be always available to accompany you during your journey to discover these works of art. Free entrance (to offer) with possibility of guided tours.